The Mica group is a large group with nearly 30 members recognized, but only a few are common. Those few however make up a large percentage of the most common rock types found in the Earth's crust. The general formula for mica is AB2-3 (Al, Si)Si-3 O-10 (F, OH)-2. In most micas the A is usually potassium, K, but can be calcium, Ca, or sodium, Na, or barium, Ba, or some other elements in the rarer micas. 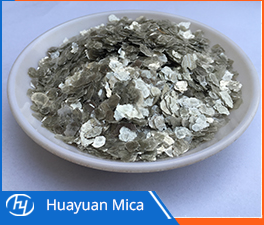 The B in most micas can be aluminum, Al, and/or lithium, Li, and/or iron, Fe, and/or magnesium, Mg.
Mica Flakes are characterized by a sheet or plate like structure which because of its excellent basal cleavage enables particles of high aspect ratio to be produced. These lamellar particles are flexible, tough, relatively soft, have a low co-efficient of thermal expansion, exceptional electrical properties and excellent chemical resistance. Mica is a reinforcing agent that will impart excellent dimensional stability of molded parts. Some of it's advantages include low warp, excellent electrical properties, reduced flammability, reduced creep, planar reinforcement and excellent resistance to weathering and corrosive attack by acids of alkalis. Previous: How to Make Your Own Mica Powder?